You can use WhatsApp with different font styles for your status and while you are texting your friends. We are going to tell you how to use bold texts on WhatsApp on this page for you. You will able to send message to your friends with this feature and you will emphasize important stuff in your message. So your friends will able to understand better what you mean in the message. You can ask any questions at comment section below, if you have any question about this subject or any other problem you face on WhatsApp. Run WhatsApp on your Android or iOS device. Open a new chat or open an existing chat. Type “*” before the message. Then type “*” again after the message. 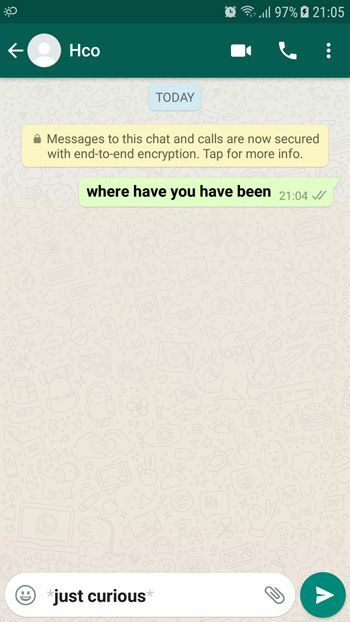 After you send the message to your friend, the message will look like this: How are you? You can see our example picture for WhatsApp bold messages. In the sent message, you will see how message will look like… In the text field, you will see exact texts to send a bold message. We hope that the picture will explain things easier than steps for you. You are done! Now you can send bold texts to your friends with this trick. You can also send strikethrough, italic messages to your friends with tips of How to Chat Online.